The Chicken Whisperer, Andy G. Schneider, will be giving away 500 baby chicks in metro Atlanta as part of his "Chicken Stimulus Package." If you're in the Atlanta area, you can meet Andy at the Greenwoods at 1087 Green Street in Roswell, GA (about 15 miles north of downtown Atlanta) where he'll start giving the chicks away at 8am on Saturday, April 11, 2009. Only two chicks will be given away to each family, and they'll come with a starter bag of feed, care instructions and a map to a local feed and seed shop where they can get more supplies. You can catch Schneider's Chicken Whisperer radio shows online at Radio Sandy Springs. Oh, and you can follow him on Twitter as @backyardpoultry. 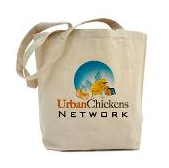 Can't wait to see what 250 families do with their urban chickens (both the hens and the roosters).